Foreigners burning joss paper. Screengrab from Facebook. These workers are believed to be of Indian descent. “Foreign workers burning joss papers at Fook Hai. What a strange sight, who made them do this?” the caption read. Burning of joss offerings are commonly practiced by the Chinese. It is believed that they appease the dead for doing so. However, it can be seen the video that Indians too practice this ritual. The video gained 223 reactions, 152 comments, and 147 shares as of the moment of writing. Netizens had their fair share of reactions to the video. “Indian and Chinese can pray to each other[‘s] gods so why the big fuss what this. As long as we respect each other religious and religion that o.k,” said one commentator. “Why they cannot pray? Chinese God come from India, people pray you also got problem. Mind your own business,” another one said. Some reactions to the video are not approving of the uploader. “Why can’t people keep their itchy hands and shame everyone on Facebook just because out of fun?? If you have no religion keep your bloody fingers to yourself and stop shaming everyone!” said another commentator. Comments of the joss burning video. Screengrab from Facebook. 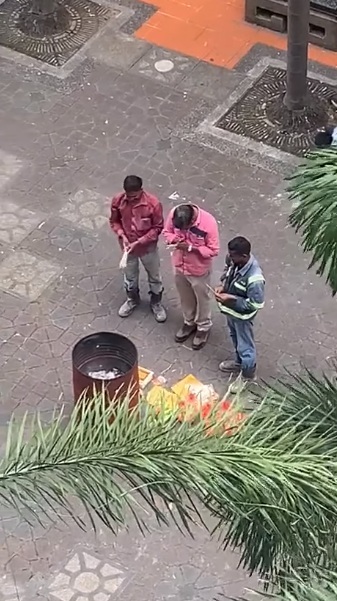 <Reader Contribution>Foreign workers burning joss papers at Fook Hai. What a strange sight, who made them do this?